Greetings again from the darkness. “The Count” versus “Papa” should not be mistaken for a new cartoon featuring Sesame Street battling The Smurfs. This Norwegian film from director Hans Petter Moland and writer Kim Fupz Aakeson is oddly entertaining, often funny and plenty violent. Stellan Skarsgard stars as Nils Dickman, a quiet, keep-to-himself snow plow operator who is being recognized as his town’s Citizen of the Year. We see Nils clearing what appears to be the same roads over and over with a snow blower that looks like some type of NASA moon vehicle … the mundane life having a rhythm that seems to deliver a kind of peace. Nils’ untroubled world is rocked when his son is murdered under suspicious circumstances. 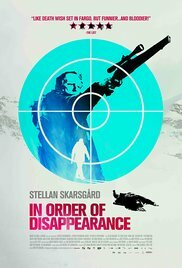 It kicks off his mission for revenge … and in the process, this snow plow operator accidently initiates a mob war between the Norwegians and the Serbs. This might have you wondering where the humor comes in. It could be compared to a Charles Bronson movie – if Bronson was an otherwise meek fellow who was laser-focused on revenge for his son’s murder (actually, that sounds like the synopsis of quite a few Bronson movies). The film is divided into chapters named after the dead bodies … and it’s a rapidly changing scoreboard. I counted 14 chapters and 24 victims, but I’ll admit it’s quite possible I missed one or two. The always interesting Bruno Ganz plays Papa, the cold-blooded leader of the Serbian mob who rarely needs to speak. Pal Sverre Hagen plays “The Count” … the first vegan movie gangster I can recall, and certainly a memorable character who at times seems like a poser, while at other times proves he is ruthless. The three main characters all have sons who play a major role in both the story and their motivation, and there is a certain symmetry in the ending as two ride off into the proverbial sunset (though the sun evidently rarely shines in this town). And even if you didn’t enjoy the subtle humor (both situational and dialogue-driven), you are likely to find a least a chuckle in one of the main character’s final words for his ex-wife. Coen Brothers influence permeates the frosty air – maybe I didn’t mention that it’s snowy and beyond cold in every scene. The snow is a character here and the real characters fall into one extreme or the other … subdued on the surface or eccentric and desperate for attention. These conflicts bring humor to situations that would otherwise offer nothing but gloom. It’s an unconventional and stylish film and one that will probably find a loyal and appreciative audience. This entry was posted on Thursday, August 25th, 2016 at 8:14 pm and is filed under Comedy, Drama, Thriller. You can follow any responses to this entry through the RSS 2.0 feed. You can leave a response, or trackback from your own site.